Our Perfectly Plain Collection Glass Jar favors are ready for you to add your own personal style to each! 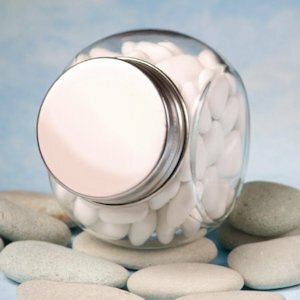 They're charming with their classic candy jar shape and silver metal screw-on lid. Add colorful candies, mints or other small trinkets to them and decorate the outside of the jars with ribbons, glass paint and more! Your guests will appreciate the heartfelt gift you made for years to come. Each glass jar measures 2.75" x 1.75". The candy shown is NOT included. For the version of this gift that offers a personalized label, please search 6701ST. I'm wondering if these would be spacious enough for a terrarium? I'm trying to fit succulents and some soil in here. If possible, could I have a general idea of what the biggest thing is that would fit in the jar? Just trying to visualize. Thanks! I'm sorry we are only able to provide you the size of the jar which is 2.75" x 1.75". I recommend ordering a sample so you can see if item works for you. What is the exact diameter of the lid? The lid of the Perfectly Plain Collection Glass Jar is around 1.5" in diameter.